Thank you for leaving a basket of baby bok choy, white sweet potatoes, and zucchini on my doorstep this weekend. It was very sweet of you to think of me. Yes, I do understand that it is your job, and I pay the company that employs you to get me those vegetables, but I still think it's pretty cool of you.You're alright. PS...I'm sorry my dog hates you. I'm pretty stoked about finding a CSA in my area. Let's be real. Daytona Beach is not the agricultural capital of the world. Although Florida grows a variety of different crops, there isn't really a huge market for local, exciting produce in my community. The farmer's markets in the area feature a couple local growers who offer traditional southern crops, but most of the venders there are selling produce straight from a grocery store boxes. Not local at all. As a person who gets more excited about heirloom variety vegetales than about diamonds, this lack of variety in my community bums me out. Plenty of jewelry stores, incidentally. SO, I was really excited to find Front Porch Pickins, a local CSA. Let's talk about CSAs for a second. If you aren't familiar with them, CSA stands for "community supported agriculture," and is a system in which consumers recieved produce directly from the farmers who grow it. While this is similar to a farmer's market, a CSA differs in that you, as a subscriber, pay in advance for the goods you are receiving. This helps fund the farmers in advance, and you reap the delicious benefits throughout the growing season. Helping your local farmers is one benefit of a CSA, but there are a couple more. When you become a subscriber, you are paying for a different basket weekly produce, but you don't necessarily know exactly what that basket will contain. 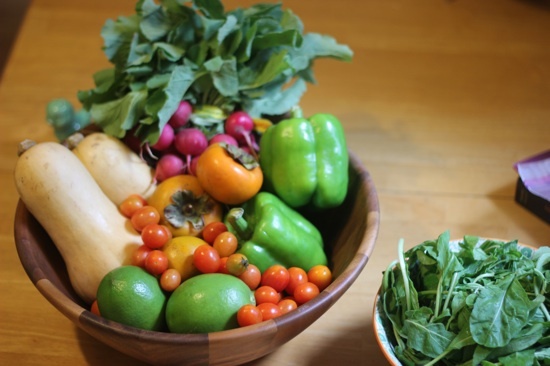 Although many CSA's will post seasonal charts on their website to give you an idea of what may come in, your basket may contain a few surpises, and often items that you have never seen or eaten before. While some might consider this a disadvantage, I like to think of it as a benefit and a challenge! Learning about and adding new vegetables to your diet is a great thing, and it can be such a fun adventure to learn how to prepare and cook them. Yet another benefit of a CSA is the direct path of the vegetables from the farmer to you. They are not packed into crates, loaded onto a giant semi, and driven across the country just to sit in a grocery store for a week before you get to it. They are picked, and within a week they are in your fridge and ready to be eaten. You will never find produce as fresh as you will when you get it from the grower. The flavor is better, and they are some of the most beautiful veggies you will ever get. I've been a member of my CSA for about three weeks, and have been pleased with the variety of produce I have gotten. If you are in the area, check them out. I know I have a lot of Virginia readers, so if you haven't found Horse & Buggy Produce yet, it's time. They are the bomb-diggity. And yes, people do still say that. People = me. For my Tallahassee friends out there, I have been told that Orchard Pond Organics is pretty awesome as well. 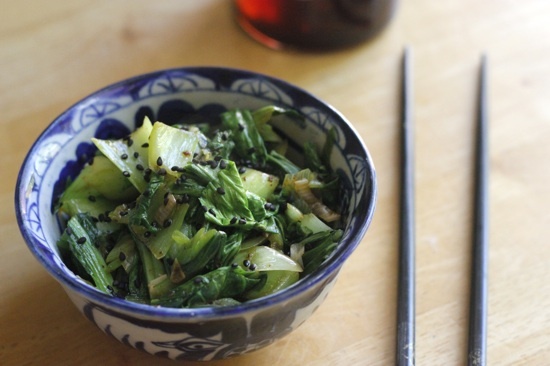 So, with my case for CSAs completed, here is a recipe using the baby bok choy I got in my basket this week. It is simple, but really delicious. It is in season in the south right now, so try to get your hands on some. A note about washing this vegetable: it can be tricky. 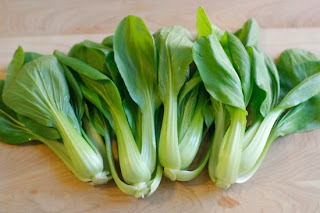 The key is to cut it up first (everything but the base, which should be removed), submerge in a bowl of cold water, swish it around, and then remove the bok choy by hand into a strainer. Do not pour the whole bowl of water and bok choy into the strainer, or you will get all the dirt with the vegetables. Dry completely before using with either a lettuce spinner or a kitchen towel. 1. Heat canola oil in wok or large skillet over high heat. 2. Add garlic and red pepper flakes. Saute for 1 minute. 3. Add bok choy stems and cook for 1-2 minutes. 4. Add bok choy leaves, green onions, and salt. Stir-fry for 2-3 more minutes, or until vegetables are tender but not mushy. 5. Remove from heat, transfer to serving dish. Drizzle with sesame oil and garnish with sesame seeds. We at Front Porch Pickings love you AND your dog. It is our pleasure to serve you.